Cue the eye-rolls…I know what you may be thinking. How cliché. A quote from an Aussie actress, used as the lead-in to a blog post about Australian language…who does this American think she is? Bear with me, because you may learn a few things if you keep on scrolling. 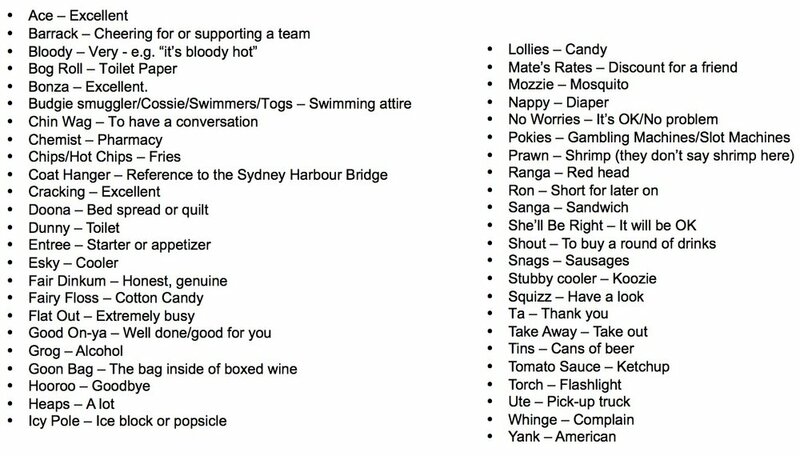 “Go Bush” is just one example of the many phrases that I’ve learned since becoming an American expat in Sydney, Australia nearly six months ago. The quote resonates with me, because it speaks to an aspect of the Australian way of life that I adore. People work hard, yet there is a genuine work-life balance that permeates the collective culture. Australians not only take time to relax, they deliberately carve out time to leave the workplace behind in favor of enjoying life’s little pleasures. There seems to be an unwritten social contract that is respected amongst Aussies, because people rarely discuss work in social settings. Admittedly, this norm has been a breath of fresh air, because I spent the past nine years living and working in New York City where social scenes were rife with work-related discussions. Stay tuned for my next installment of “Learning to Speak ‘Strayan” in a few months. I hope to be at guru status by that time. Until then…See ya ron, mate!